Many toddlers―curious, active and eager to explore their surroundings―are attracted to water. It shines, ripples, splashes, and can even make things float! But, they don't understand that water can be dangerous and aren't old enough yet to do what is needed when in trouble. So, it's essential to protect them from water hazards where you live and where you visit. Water safety is important for all ages, but especially for toddlers. Drowning is the leading cause of injury death in children 1-4. Young children can drown in as little as an inch or two of water, and it can happen quickly and silently. The biggest drowning threat facing families with toddlers is unexpected, unsupervised access to water: swimming pools, hot tubs and spas, bathtubs, natural bodies of water such as ponds, and standing water in homes. For example, 69% of all drownings among children age 4 and younger happen during non-swim times. To lower the risk of drowning and other water-related injuries to children, the American Academy of Pediatrics (AAP) recommends using "layers" of protection. When children are not expected to be around the water (non-swim times), barriers can help prevent tragedies during inevitable, brief lapses in supervision which are a normal part of every day. When children are playing in and around water, close and constant supervision become essential. Preventing unintended, unsupervised access to water is proven to be one of the most effective ways to reduce drowning deaths among young children. Start with these layers of protection in and around your home to help make your toddler's environment safer. Keep the gate locked at all times and check it frequently to be sure it works. Keep toys out of the pool area when not in use so that children are not tempted to try to get through the fence during non-swim time. Also be sure to always cover and lock hot tubs, spas and whirlpools right after using them. Bird baths, fountains, and ponds. Although these can be beautiful landscape features, consider holding off on installing or using them until your child is older. Wells, irrigation, or drainage ditches. Also be careful to prevent children's access to open post holes while structures like fences, decks, birdhouses and flagpoles are being put in. Use safety gates, door locks or doorknob covers to prevent your toddler from going outside or into your garage unnoticed. Make sure siblings and all other family members know to always close the door behind them so younger children don't follow them out. The bathroom can be a risky place for toddlers. They can topple headfirst into toilet bowls and filled tubs, or scald themselves with water that's too hot. Use safety latches or doorknob covers to keep bathrooms closed when they're not in use. As an added layer of protection, install latches or locks on toilet seat lids, and consider removing the bath tub drain plug when it's not in use to avoid the tub filling if a child turns on the faucet. Whenever your toddler is in or near water, give them your undivided attention. It's important to avoid doing anything that would make it hard to stay focused, such as using your cell phone, doing yard work, or drinking alcohol. The AAP recommends staying within arm's length, providing constant "touch supervision," whether it's bath time or swim time. Most child drownings inside the home occur in bathtubs, usually during a lapse in adult supervision. During swim time, get in the water with your toddler. If you need to get out, take your child with you, even if lifeguards are present. Especially during parties or picnics at the pool or lake, when it's easy to get distracted, assign a "water watcher" to constantly keep eyes on the child. Take turns, passing along a water watcher card to the next responsible adult after a set time (such as 15 minutes). 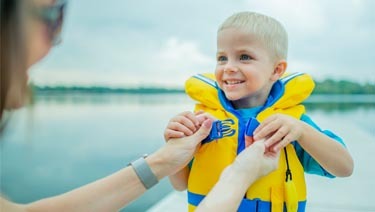 Children should always wear life jackets when in, on, or near natural bodies of water, such as lakes or rivers. Make sure they fit properly and are approved by the US Coast Guard. Children and others who lack strong swim skills should also wear life jackets when at a pool or water park. The AAP recommends swim lessons for all children, and their parents, as another layer of water safety. Recent studies suggest that water survival skills training and swim lessons can help reduce drowning risk for all children including those 1 to 4 years. Deciding when to start should be based on a variety of individual factors, including how often your child may be around water, your child's emotional maturity, physical and developmental abilities and limitations, interest in learning to swim, and how comfortable he or she is in the water. Your pediatrician is a good resource to help know if your toddler is ready. Know how to respond when there is trouble. Everyone, including parents, caregivers and older children, should learn CPR and safe rescue techniques to respond to a drowning incident. Water safety is a family affair! Always keep your toddler's safety in mind around water―at home, where your friends, relatives, and caregivers live, and places you stay during family trips. Prevent unsupervised access during non-swim times and provide close, constant supervision while in or around water. Be sure to talk with your pediatrician at your child's wellness visits about guarding against common water dangers.